I did not know much about Montenegro to be honest. During my years studying Wildlife Conservation Management in Leeuwarden (The Netherlands) I had a friend who was born in this mysterious country and he always told me it was like heaven on earth. Well, now it was time to find out. I was ready for my adventurous Montenegro road trip! To me it sounded like an exotic country far away in the Balkan mountains, which was the home of big casino’s and ancient castles right next to the beautiful Adriatic coastline. An unusual, yet interesting mix that would intrigue me to add Montenegro on my road trip list. And in case you are wondering, I indeed felt like James Bond driving my Green Volkswagen Beetle across the serpentine roads. The name is Guy… Road Trip GUY! Crossing the border from Albania to Montenegro is a one of a kind experience. It cost me exactly .. well.. it did not cost me anything at all, to be honest. Yup, just like I said. There is no border when you drive from Tirana to Ulcinji and I realized this was the case when I was standing at the welcome sign of Ulcinji. “Did I miss something?” I thought. Till this day I still do not understand how I got into Montenegro, but if you had a similar experience traveling from Albania, please leave a reply in the comments below. What a great start of my road trip in Montenegro. I was looking forward to a driving adventure in the Balkans. My first stop was in Ulcinj. It was not an easy place to find as you need to follow a small forrest road through the hills before your reach this little beach town. Here I stayed at a local guesthouse with a family with 4 kids. They were very impressed with the Volkswagen Beetle and almost right away I became a part of the family. Their kindness really made me feel at home and they showed me on the map which places I needed to visit. First stop would be Ulcinj Old Town. Here is where you find all the bars and restaurants and during the nighttime it gets really busy. If you drive down the road you will eventually get to an intersection that allows you to go to the beach (left) or park your car (right) at a big parking area next to the little marina. I recommend you park your car here as it will be almost impossible to find a parking spot next to the beach. It is only a short 5-minute walk, but right next to the viewing point of the city. On top of the viewing point you will find a great restaurant at Hotel Kulla e Balshajve. They serve amazing Italian food and with a view you will never forget. You pay an average 5 Euro per meal. Bar was a boring little town. It did not have the charm of Ulcinj and also the beaches did not have sand, but just rocks. I was a bit disappointed, but thankfully the hotel owner told me that I should visit a beach club nearby the famous Sveti Stefan. It would be a perfect beach for relaxing and had one of the best snorkel spots of the country. Visiting Sveti Stefan is a must-do when you are doing a road trip in Montenegro. Unfortunately, it is not allowed to go on the island as it is owned by a hotel, therefore only guests can visit the place. It was a bit of a disappointment but understandable. When you drive towards Budva, I recommend you make a stop on the highway and take your picture from there. The view is much better from the top, then it is from the beach-side. The beach club was called Plaza Galija and the hotel owner was not kidding as this was indeed one of the best beaches I have seen in the Balkan area. It is a bit tricky to find as you have to cross a campsite in order to get to coastline, but once you get it there it is definitely worth the hassle. Nice relaxing lounge music, great food and lots of different cocktails. I snorkeled the whole bay during the day and there was so much marine life and rocks that I wish I could have stayed even longer. Located right next to the beaches, Budva is a popular tourist destination in Montenegro. I wanted to explore the city with a local, but all the tourist traps included getting hammered and stuffed on a big “booz” cruise. I had already my fair share of experiences with those during my teenager years in Turkey and Spain, therefore I was looking for something more traditional. It took some time to find the right thing, but then I saw an old fisherman, sitting in his boat looking pretty sad. We started talking a bit and the season had been slow and you could see he was struggling to make enough money with his fishing activities. I told him that I was not interested in going fishing, but I would pay 20 Euro if he could show me around Budva. A big smile appeared on his face and before I knew it we were heading out to sea and even though we did not speak each others language we had the best time ever! The first stop of the tour was the Old-Town of Budva. This beautiful little town-square has a unique location on the top-side of Budva Marina. It was a stunning view and many people were waving us goodbye from the town walls. It felt like I was going to upon this gigantic voyage to fight pirates and stuff! We turned around and were going for the big island: Sveti Nikola. We made a beautiful pass through Hawaii Beach and the captain took me inside all the small lagoons to see the beautiful nature and crystal clear turquoise water. Once we were all the way around the island, I was taken to this beautiful little cave on the east-side. It was a popular fishing destination as the captain told me the fish like to escape the warm sun by hiding in the cool shades of the cave. Entering the cave on the east-side of the island. Overall it was an amazing experience and I would highly recommend finding a local guide, pay him some money and go have an adventure! 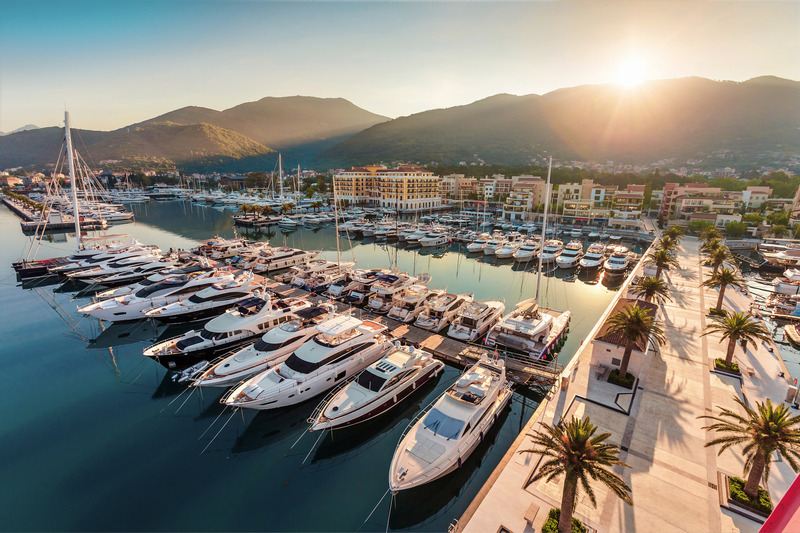 Kotor and Tivat are just a 25-minute drive from Budva. Of course, that is if you do not have any traffic! Unfortunate, you can see that the road works are not up to date compared to the tourism boost over the last 20 years. This results in very long traffic jams and especially in Kotor it was a real nightmare. Go as early as possible to find a parking sport or be prepared to walk over an hour back to the city center. The main attraction is visiting the amazing Kotor Fortress and although the climb is not an easy one (1350 steps and 1200 meter up), the view is something from a movie-scene! If you take the left turn when you enter Kotor, you can actually dive all the way to Tivat with the sea right next to you. The roads are very small, so we had a few close encounters but as long as you drive carefully it should not cause any major problems. There are several restaurants, shops and of course boats.. lots of boats! Which you can also buy if you wish.. with a starting price of around 7-figures! If you want to get something to eat or have a drink I recommend you walk out of the port towards the old-town of Tivat. The prices are much cheaper there and it is only a 5-minute walk from the port. It has a nice cozy atmosphere with a beautiful view over the mountains, sea and gigantic boats!